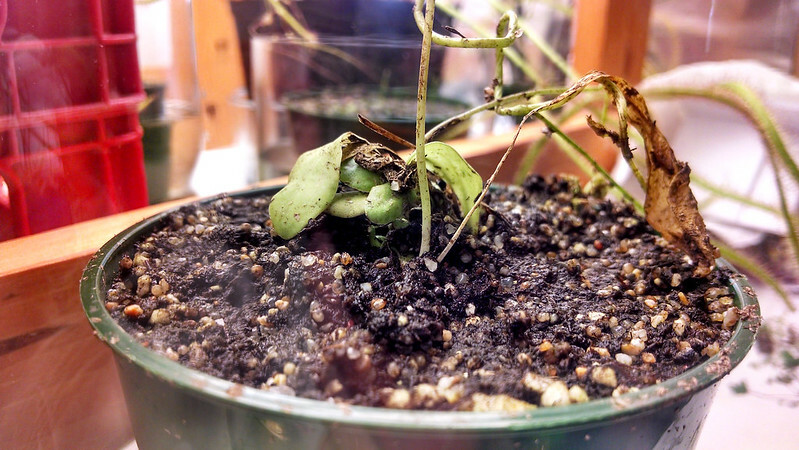 Utricularia are the most widespread and diverse of all carnivorous plants, even more so than Drosera. Also known as bladderworts, for their bladder-like traps (which are worth reading about on Wikipedia, though I won't go into it here), they are typically grown in cultivation not for the traps (which are usually hard to see) or their foliage (which ranges from "almost invisible" to "somewhat interesting"), but for their flowers. The most impressive species are from section Orchidioides, which are – alas – among the more difficult to grow. However, even the easy (and sometimes weedy) terrestrial Utricularia can have charming displays of flowers. I like to grow them because they're peculiar and a little offbeat, and I can dream about a nice big bloom show to share with people someday. A small but healthy plug of U. sandersonii blue. 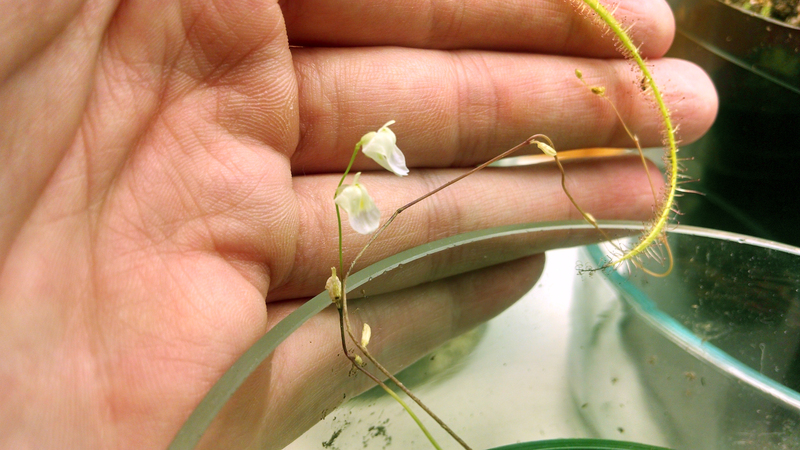 This is Utricularia sandersonii, the blue-flowering variety. U. sandersonii are sometimes referred to as "angry bunnies" because of the shape of their flowers. I bought this chunk from Natch Greyes a couple months ago, and it has held steady and shown some slight growth. 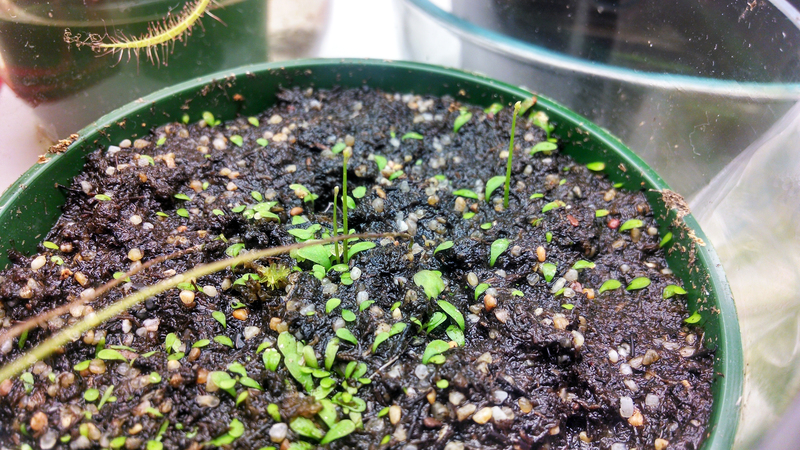 The U. livida I got at the same time is doing great, but this is just fine. I'm sure it'll take off eventually. Typical U. sandersonii bouncing back from a rough time in transit. This typical form of U. sandersonii I got in a giveaway over at Terra Forums. I think it sat in my garage for a day or two because no one told me it had been delivered, so it was a bit more beat up than the blue form. 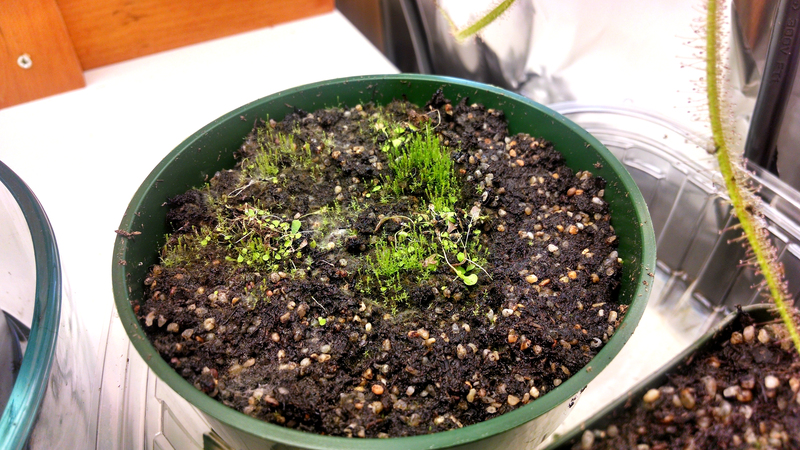 It's got some new growth, and also has plenty of mosses growing to keep it company (heh). The peculiar leaves of U. praelonga are cool, although apparently it's difficult to get to flower. 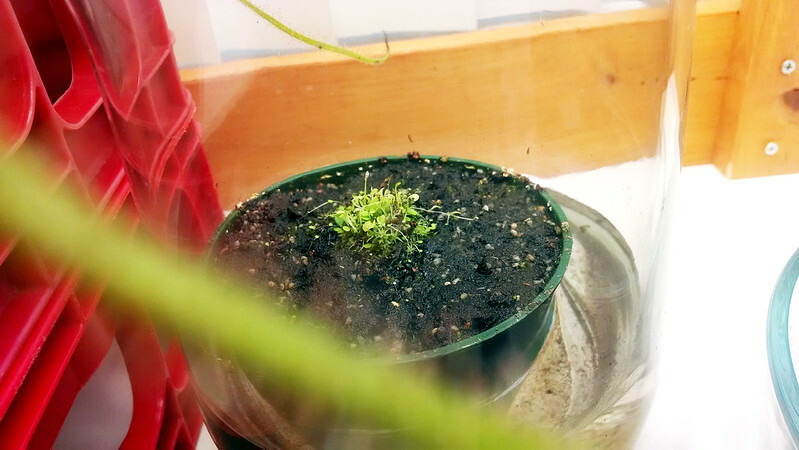 Utricularia praelonga is an odd species that produces two kinds of leaves – the typical terrestrial utric leaves, as seen on the U. sandersonii and U. livida, and also long, grass-like leaves. This one I received in a trade for a couple of my D. burmannii seedlings. U. calycifida looking a bit beat up from shipping. My newest Utric is U. calycifida, which I received in the NASC auction (I still need to make a post about those plants, now that they've all arrived). It's still recovering from shipping, but is a very nice specimen. U. calcyfida has largish leaves and long flower stalks, when you can convince it to bloom. Very much looking forward to it settling in. My Utricularia livida is the only one I've posted about before, on account of it having popped out a bloom on one of its old stalks. 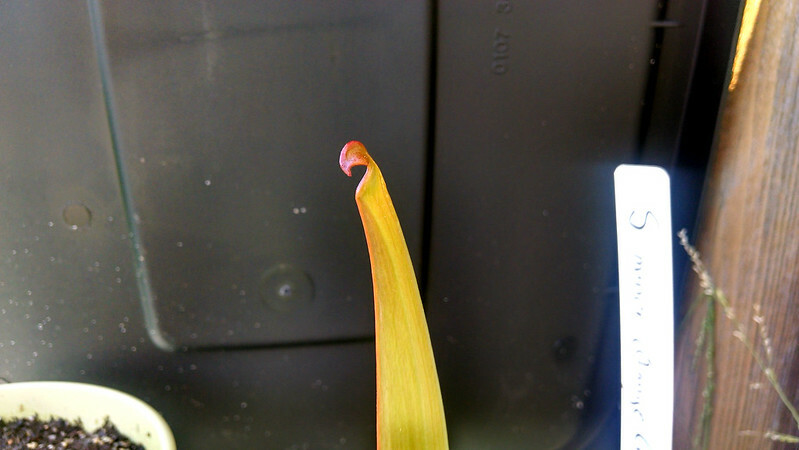 Here's that stalk now, with two tiny flowers. Itty bitty U. livida flowers. But the really exciting thing is clear when you look much closer. Someday I want a healthy carpet of foliage and full stand of flower stalks from this U. livida. Three new scapes coming up! It's also really filling up the pot, which is great. 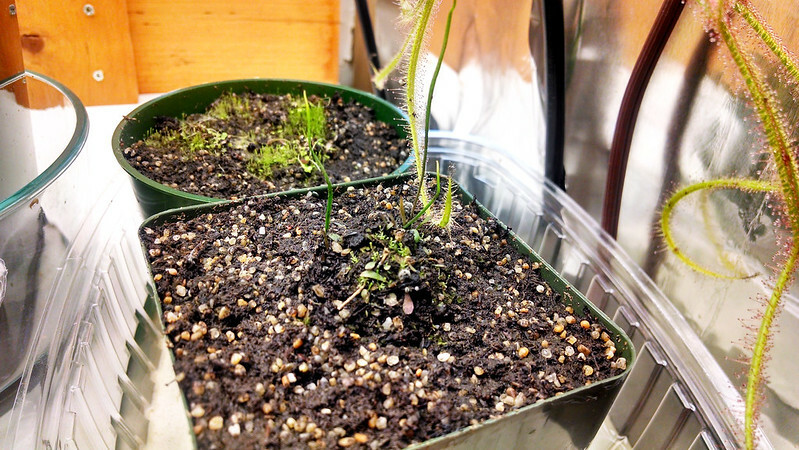 This is supposed to be a very weedy species, which is fine, since it's in its own container. That just means it will fill out better. Really looking forward to seeing these develop further. Speaking of containers, here's a shot of where I grow my Utrics. My (somewhat messy) terrestrial Utricularia area. 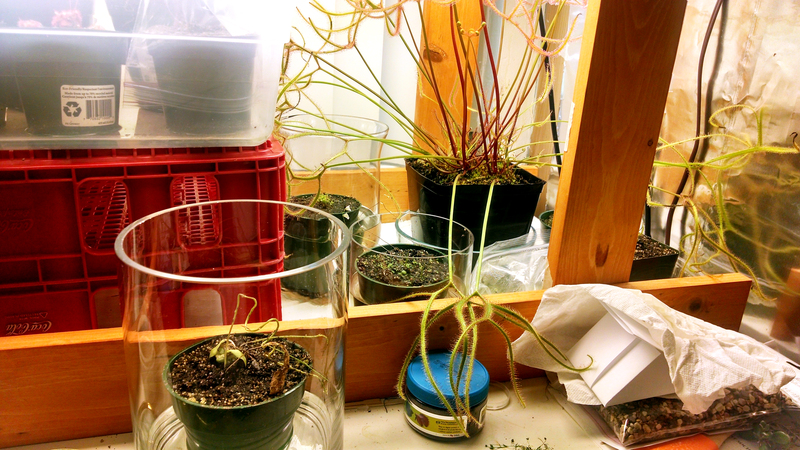 As you can see, there are individual glass containers for each specimen (almost – the U. praelonga and U. sandersonii typical are bunking together right now). This is somewhat inefficient in terms of space, but it keeps them from infesting other pots, and will make for handsome displays once they start blooming (it's important to think positive). Also these glass things can be found for cheap if you keep an eye open. On a final note, my Sarracenia are developing nicely, and originally I'd hoped to post about them today. However, the gods of photography frowned on my attempts to get decent closeup shots (the camera software on my phone is terrible), so all I have is one peek at Sarracenia minor. It's getting there! S. minor with some decent coloration going. Looking forward to seeing full pitchers! The S. flava and S. leucophylla each have pitchers almost 18 inches tall right now, but we'll have to wait for different conditions to get a photo. Alright. It's extremely hot now, and my bedroom gets afternoon sun. I'm going to retreat to the garage, which stays cool, and read a book. I hope my D. spiralis can handle a couple days of heat before the temperature drop this weekend.